As her life veers off in a direction she never expected, Carrie soon understands that she is running a course with a destiny that lies far beyond her control. A destiny that is strangely aligned with her Captain’s. 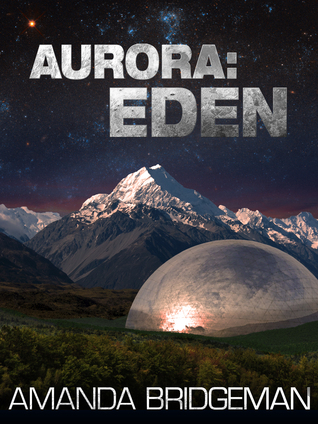 Aurora: Eden is fifth in Amanda Bridgeman's Aurora series and picks up shortly after Aurora: Centralis leaves off. I felt the transition between the first four books, the balance between the team dealing with the losses of the past and the dangers in their future and finally, as I've come to enjoy, the capital A Action at the end. I must admit to having become fan-girly about this series. I love the action, the enhanced soldiers and the fact the women are allowed to be women. I disagree with any suggestion Welles and the other women in these books receive unequal treatment due to their gender. I agree with the reality in the Aurora series. Regardless of training, enhancement or opportunity I'll take a strong woman in a futuristic novel over one who is assumed able to take on an opponent ten inches taller and a hundred pounds heavier. Strong women are okay. Now I must also admit that Ms. Bridgeman has my heart on a string when it comes to the Aurora crew. After the unfathomably strong yank she gave that string at the end of book four Aurora: Centralis, I tried hard to hold back on my attachment to the crew but for me it was a losing battle. Where the other novels in the series gave us a prologue to position Sharley and mainly filtered his actions through the POV of the Aurora crew, Eden gives us tastes of Sharley's men throughout. For me, this drove Bridgeman's tension high. Considering the backgrounds of Sharley's new recruits, I approached the battle I knew must be coming with huge apprehension. The way she moved quickly back and forth through all the action at the end really worked. I was left anxious about so many things at once and considering that one string that got pulled at the end of Aurora: Centralis the thought Ms. Bridgeman had the courage to pull it again was always there. Sticking with this series is easy for me. It's a great story with strong, consistent and very real characters. Each book ends with a bang though each bang is different and exciting and I've never been left to feel I've seen it before even though the players (for the most part) remain the same. This is a series I will continue to invest my time in. No hesitation. My deepening attachment to the Aurora's crew makes each book better than the one before and for me, that's the number one sign of a great series. They grow, they change and through it all, their choices, both easy and hard, are understandable.